The environment is our shared home. It is crucial that we do everything and anything to live sustainably now. The biggest gift we can give our children is a healthy home. Please read below to learn how you can live more sustainably today to ensure these precious resources are still here tomorrow. Click on the blue hyperlinks to go to external websites and learn more. We need water. Try to image a day without directly using water. You would be thirsty, you could not shower, and you could not use a flush toilet. Now try imagining a day without indirectly using water. You would really have a tough time. You could not have any food, you would have no clothes, no shelter. Water is used in manufacturing, mining, and electricity production. Even worse, without water, no living things would exist! The environment provides natural resources and services. Clean water is just one service. When the environment and wildlife are not healthy, people cannot receive those services. We would have no clean water, no food, and no clean air to breathe. Even if you don't really care about trees, and would never be caught giving one a hug, we must protect the environment to make sure we have enough resources to continue living. Want to learn more about water? Click to learn about the water cycle, watersheds, water pollution, and water management in San Antonio. The majority of the water that comes out of faucets in San Antonio is from the Edwards Aquifer. This is an amazing source of fresh, clean, tasty water. An aquifer is an area of rock underground that contains a body of water which flows to springs and wells. The Edwards Aquifer is made of limestone and reaches across Texas. The Edwards Aquifer has many caves where the aquifer meets the surface. Creatures like the Texas blind salamander live in these caves. When the water flows above ground, bodies of water, including the San Antonio River, are fed. The San Antonio River water flows from its headwaters at Headwaters at Incarnate Word, through downtown, and to the gulf. At the gulf, the San Antonio River feeds estuaries, the meeting places of rivers and oceans. Estuaries are rich in nutrients and full of hiding spots. The whooping crane spends its winters in estuaries fed by the San Antonio River. The Edwards Aquifer, and all water on Earth, is replenished in a constant cycle. The water cycle, driven by the sun's energy, is what causes the rain, and what provides us with fresh water to drink. However, the water cycle can only go so fast. 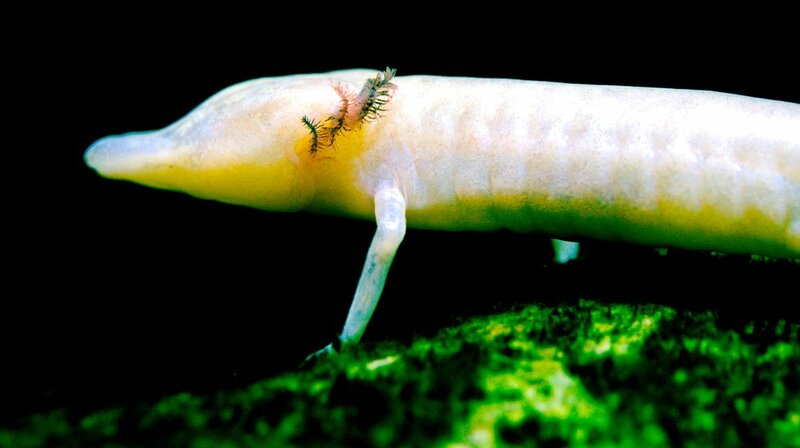 If we take water out of natural resources, like the Edwards Aquifer, faster than it can be replenished people will suffer, but endangered species like the Texas blind salamander and whooping crane could go extinct. The average US citizen uses 100 gallons, or 757 water bottles worth, of water each day. The average American uses 80 - 100 gallons of water per day (USGS, 2016). View the modified text below from USGS to see what you can do to conserve water. Showering: Most shower heads use 2 –5 gallons of water per minute. Try soaping up without water then rinsing off all at once. See this article for more information. Shaving: When shaving, use a small bowl of water instead of letting water run. Don’t shave in the shower. Washing Dishes: If possible, use a newer, energy efficient dishwashing machine. Newer machines use about 6 gallons of water, but older machines can use up to 16 gallons. If washing by hand, use a basin of water instead of running water. Scrape leftover food into the garbage, and let dishes soak beforehand if food is caked on. Washing Clothes: Just like dishwashers, newer, energy efficient washing machines use less water, 25 gallons instead of 40 gallons per load. Try hanging clothes up after wearing them to air out. Items like pants, sweaters, or shirts worn with undershirts might not need to be washed after every use. Outdoor Watering: Your outdoor faucet can use 2 gallons of water per minute. That adds up quickly when watering large areas. Plant native plants that are drought resistant, and have the added bonus of providing food and habitat for native animals. See the SAWS website for information on landscaping sustainably. Use Less: Water is used for everything from harvesting raw materials, manufacturing cars and sneakers, producing electricity, to transporting goods. You can turn off lights and unplug appliances when not in use to decrease electricity usage. Buying concentrating cleaning products cuts down on transportation, and making your own cleaning products is even better. Buy two or three pairs of high quality shoes that will last instead of frequently buying many pairs of lower quality shoes. These indirect uses of water add up, and by using less, you are conserving water. More water conservation tips can be found here and here. Stop what you are doing and look down. Is there land underneath you? Maybe not if you are on a boat, but even then you will have to come back to dry land eventually! We all need a physical space. That "we" includes billions of people, but also billions more plants and animals. Many of those plants and animals are not in good shape. Habitat loss is a major threat to wildlife. If we expect to continue receiving resources and services from nature like clean water, clean air, and raw materials to make our goods, we need to protect land and habitat. San Antonio, and the state of Texas, have a rich network of parks that encourage people of all ages to enjoy the outdoors, but there are many ways to protect land. Major efforts to protect and preserve land associated with the Edwards Aquifer are spread throughout San Antonio. One way everyday San Antonians are becoming sustainability leaders is through conservation easements. Want to learn how land is made? Click to learn about the rock cycle, soil, and plate tectonics. Using fewer resources is a great way to protect nature. Using less is easy when you remember your three R's: reduce, then reuse, then recycle. Follow the three R's by asking "Do I need this or do I want this?" then say, "If I have to buy this, can it be reused and recycled later?" Reducing is the best of the three R's. You might find that reducing is actually cheaper in the long term. Try using dish cloths and cloth napkins instead of paper towel and paper napkins, carry a reusable water bottle with you, absolutely always say no to plastic straws. If you cannot find a way to avoid buying something, always try to buy that product in a way that will allow you to use a piece of it later. This is the second R, reuse. When your old clothes are too worn out to be donated, try cutting them up for cleaning clothes or for washing the dog. You can reuse other things like rubber-bands and twisty ties that come in packaging, or plastic shopping bags and used ziploc bags to pick up dog waste. Finally, when you cannot reduce or reuse, always try to recycle. A great example of the three R's can be shown using tomato sauce. The best way to get tomato sauce is to grow or buy local tomatoes and make your own (reduce). If you do not have the time or skills to make your own, buy tomato sauce in a glass jar, and use that glass jar to store leftovers, dried beans, beads, or pencils after the jar is cleaned (reuse). Finally, when the jar is no longer useful, properly recycle it according to your city's regulations (recycle). Another preservation tool is a nature sanctuary. Headwaters at Incarnate Word is the nonprofit organization that protects the 53-acre Headwaters Sanctuary. The Headwaters Sanctuary is special because it is a place for wildlife, a place in history, and a place for people to reflect. There are many reasons to protect this land. The Sanctuary is mostly riparian forest. This forest is used as habitat for many types of plants and animals. Protecting any and all native wildlife increases biodiversity. Biodiversity is what ensures there is wildlife left after an extreme natural event like a flood or drought. The riparian vegetation does many things. Root structures keep soil and river banks from eroding and being washed away. The vegetation slows and filters water before it enters the river or creek. Canopy, the layer of tree leaves and branches in the air, keeps the river from getting boiling hot during Texas summers. Plants provide food for animals and support a healthy food web. Picture of San Antonio River just downstream from headwaters. The Sanctuary also protects part of the rich history of the city of San Antonio. The river and its headwaters have made living in this area possible for at least 12,000 years. After Spanish colonization, the water revered as sacred by indigenous people was channeled to provide irrigation for the missions. Now, the San Antonio River Walk connects the missions and brings prosperity to the San Antonio economy. Still sacred to this day, areas along the river like the Blue Hole remind us that without the river, there would be no city. The Headwaters Sanctuary connects us to nature. Green spaces can improve mental and physical health. The Sanctuary is a quiet place near the city center. People can use the land to meditate, reflect on their day, or simply clear their minds as they walk the trails. Headwaters offers many offerings like nature walks, birding, workshops, films, lectures, and tours that teach the community about this hidden jewel. The Headwaters Sanctuary helps us understand the complex relationships people have had with the San Antonio River, and between ourselves, for the past 12,000 years.It is important we protect areas like the Headwaters Sanctuary so we can continue to provide a home for plants and animals. The river, the surrounding land, and its inhabitants, provide us with services like water purification and nutrient cycling. To ensure we can continue to receive these services, we must protect the land. Use your three R's to decrease the amount of trash that ends up in the river. Learn more about protecting the Headwaters Sanctuary on our Support and Donate pages. Headwaters offers numerous, regularly occurring opportunities to flex your conservation muscles. Anyone and everyone is welcome to join the Headwaters community. We offer volunteer opportunities and education for adults and children. Our diverse community of volunteers, staff, and activity participants work to explore, learn about, and protect the Sanctuary for future generations. We gladly receive all of any age, background, or ability. Contact our offices and explore the rest of our website to learn more. Did you know that you can help the environment and native animals without leaving your property? Gardening and landscaping can provide crucial resources for native wildlife, including the magnificent monarch butterfly. Instead of filling your yard with non-native, water-thirsty grass, try wildscaping. Many native and non-native plants are drought resistant, but only native plants provide the appropriate food and shelter native animals need. For more information on wildscaping, visit the Texas Parks and Wildlife website. Citizen Science is a way for you to help nature through gathering and submitting data about the environment. It is very easy, and anyone can do it! There are citizen science programs around San Antonio, Texas, and the US in every subject. Mitchell Lake Audubon Center has bird and frog watches. Become a Watershed Wise Citizen Scientist with the San Antonio River Authority. Cibolo Nature Center in Boerne, TX has a week of citizen science for every plant and animal in the spring and fall each year. You can combat invasives across Texas through Texasinvasives.org. These are just a few of the MANY citizen science opportunities around the state and country. Whatever you do, you will be making a difference, and potentially preventing a species from going extinct. To find citizen science projects, enter "citizen science San Antonio TX" into the search bar of your preferred internet browser. Environmental science is the study of the environment. Environmentalism is action taken to protect nature, the environment, and wildlife. Environmentalism can be as simple as talking to your neighbor about using less water, or as involved as organizing events in support of environmental issues. At Headwaters, we are passionate about environmental issues, especially those relating to water. We hope that every soul who visits the Headwaters Sanctuary and the Blue Hole will be inspired to do all they can to protect these precious natural resources. Do your part by conserving water, following the three R's, and volunteering your time.